So, I have been taking a four week online class called Everyone Can Write A Little. It is based on writing short blog entries on Twitter or Facebook. (Yes, I tweet). The class includes a page template that you use in Photoshop Elements or any other photo editing program. 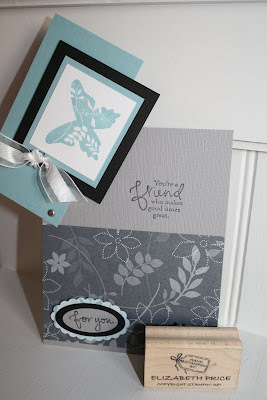 I thought I would take a plunge into the world of digital scrappin' as Stampin' Up! will shortly be releasing a digital product line. 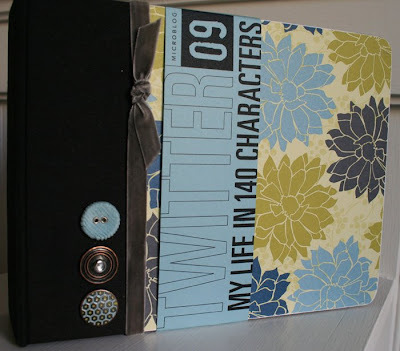 What I have enjoyed about the class is the combination of making a book and pages to mount your printed pages. I need an element of paper cratftin' and this has been a nice blend digital scrappin' and paper craftin'. What you see here is a picture of the bound book and the title page. Each of the of the entry pages are printed on the computer and then mounted on a 6" x 6" piece of black cardstock. It's a cool book that I will keep adding quick pages until the book is bursting full. There is room for at least 30 blog entries. Is this just the cutest party favor? Scatter a few of these down a table with ribbons and balloons and what an awesome tablescape you can have. 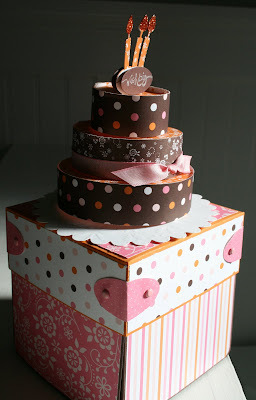 Check back for the Inside Birthday Cake Box in just a few days. 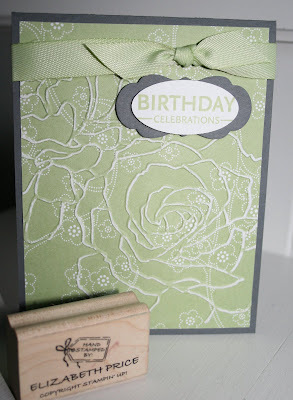 The Manhattan Flower Texture folder is super popular. Why? 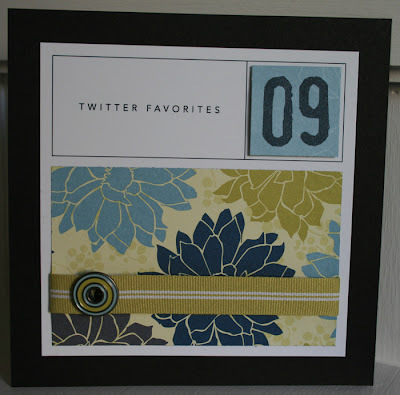 Because it makes up a beautiful card in mere seconds. Just impress, sand, and adorn with a greeting and/or bow and you're done. The layer behind the greeting oval comes from the Lots of Tags set of Sizzlet dies. Have you ever done the Rolling Marbles technique? Just add a few drops of Classic Ink Refill, three to four marbles, and a piece of casrdstock in a plastic stamp storage case and shake. It is fun to watch the paper get covered with trails of ink, but more fun to shake, rattle and roll out some serious energy. Do you like the large oval scallop? I learned that quick tip from Julie B. Just punch out two round scallop circles and place them side by side. How simple is that? Hinge card or Bic Lighter? 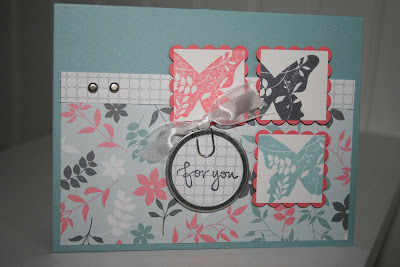 Take a look at this hinge card inspired by Julie B. When flipped up it totally reminds me of those old Bic commercials. They would say "with a flick of my bic." 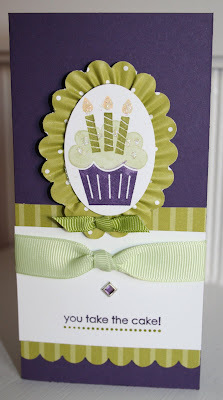 We learned the ruffled edge technique in last week's Technique Time stamp class and here is the exact card we made. 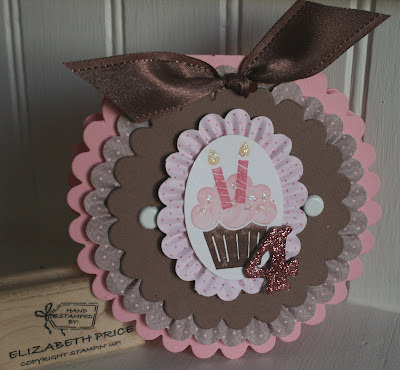 Party Hearty is the set we used and it is a perfect birthday themed conglomeration of images. Notice I stepped out of my color comfort zone and used Elegant Eggplant for my main hue. This card came out super crazy. It's cute, but maybe just a few too many scallops. I do love ruffles, but the kind with ridges and onion dip! 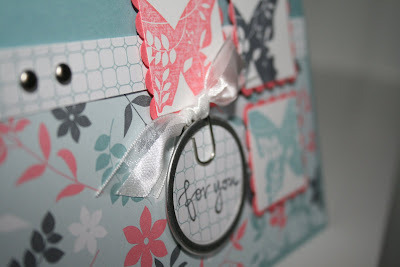 I made a card base by using the Scallop Circle die through the Big Shot. I very simply folded my cardstock in half and placed the fold inside the scallop so as NOT to cut a full circle. If you look close at the pink cardstock above the ribbon tie you'll see the fold. 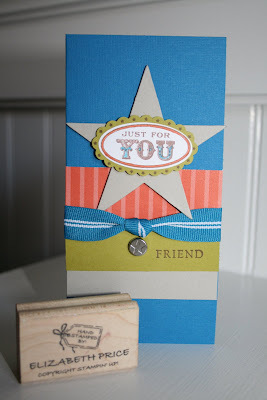 I just wanted to share a Great Friend card with a simple layout and a sweet color combo. This season's Occasions Mini Catalog has two AWESOME new additions. One, the Oval All stamp set and two the Scallop Oval Punch. 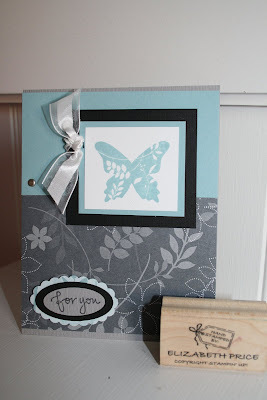 Check out this card made by Julie B., one of my most favorite stampin' buddies. She use both of the new products in the 3" x 6" card. I am diggin' the repetition of the star brad to echo the large chipboard star.